In September of 2008, less than one million cars and trucks were sold in the U.S. (compare this to the 3.1 million sold in June of 2012). The automobile industry was imploding on a level that was once thought unimaginable. Ford was losing less money than G.M. and Chrysler, which was small comfort since it was losing $83 million a day. Alan Mulally – the man who had once saved Boeing – took over a scared company and decided to go on the offensive. He optioned everything Ford owned, including the rights to use its trademark Blue Oval logo, in exchange for the funds needed to literally go for broke. His daring comeback plans proved to be amazingly – and almost shockingly, effective. Bryce Hoffman presents an engaging story of Ford’s near-miraculous survival, but this telling is tamed by a couple of factors. 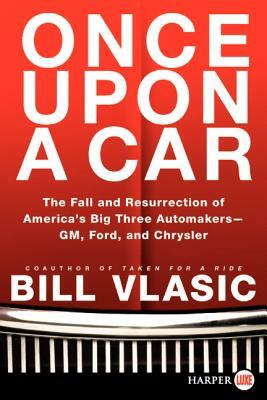 The most interesting personal accounts of life at Ford were earlier presented in Bill Vlasic’s truly excellent Once Upon a Car. American Icon is also harmed by a poor editing job that finds words missing in some sentences, while other sentences contain unneeded words. Let’s hope the book is properly edited prior to its trade paper release. Together, Vlasic’s and Hoffman’s accounts should serve to properly remind American consumers of the proud role that “FoMoCo” has played in our country’s manufacturing history. Ford has become a continuing success story of innovation, daring and common sense; it now builds the type of good quality, fuel-efficient cars that American drivers actually want to drive. (It was the first car manufacturer to switch from SUVs to crossovers.) And the American icon is not Alan Mulally, but the Ford Blue Oval logo that at one time might have been sold – for pennies on the dollar – to a Chinese start-up company to stick on cheap subcompacts. That is one fate that we escaped, thanks to the brilliance of Mr. Mulally. Disclosure: The reviewer served on the Ford Motor Company Consumer Advisory Board. The Germans couldn’t change their company’s name back to Daimler fast enough. Chrysler was a bad memory, and the automotive merger of the century a regrettable failure. In 2005, the Ford Motor Company built 4.8 million cars and trucks, and sold 3.3 million of them. This meant that 1.5 million sparkling new cars, SUVs, trucks and pick-ups were destroyed. Such was the prelude to the disaster that fell upon the auto industry when the U.S. economy hit rock-bottom three years later in the summer of 2008. Ironically, Ford was the manufacturer left standing, while General Motors (GM) and Chrysler came within days and weeks of shutting down operations forever. GM had made some tough decisions, but it had not made them soon enough. This is the tale of that implosion caused by faulty leadership and tepid management at two of the Big Three auto firms. GM was within just weeks of insolvency when Barack Obama took over as president. Yet GM’s then-chief, Rick Wagoner, “refused to even discuss bankruptcy as an option” and flew on a fancy corporate jet when he first traveled to D.C. to ask the nation’s politicians for a hand-out. Wagoner’s leadership proved to be so disastrous that the Obama administration made Wagoner’s resignation one of the pre-requisites for federal support. In its time of need, GM was missing the one attribute that could save it: credibility. Wagoner was so detached that, “…he left the actual duties of building cars at arm’s length.” Vlasic, though, not only details Wagoner’s many failings in this “fly on the corporate wall” account, he also takes us through the hopeful marriage and subsequently messy divorce of Daimler-Benz and Chrysler; and he shows us how and why forward-thinking leadership ensured that Ford would survive without needed dollars from American taxpayers. Did America care enough about the autoworkers to save them? (The) help was not simply to save GM or Chrysler, but rather to prevent an economic catastrophe on the order of the Great Depression. Vlasic’s uber-detailed 400 page reporting will leave even the most skeptical reader with a full and fair understanding of why the federal automobile bailout of 2009 was essential; well, anybody not named Mitt Romney. For years, the Big Three had been operating on razor thin profits (literally, working for cents on the dollar); in ’08 Ford brought in $38 billion in revenue, of which only $100 million remained as profit. It was a business model that could not last, especially because more than 3 million jobs in the U.S. were tied to the auto industry. The Big Three had to hit bottom – or avoid doing so, in Ford’s case – and refocus in order to see a future in which American consumers would prefer to drive a Ford Focus rather than a Hummer or Escalade: “It had a special, European-style direct injection turbocharged engine.” It’s a new day in Detroit and Once Upon a Car tells the story of how we arrived here, for better rather than worse… And, baby, you can drive my Focus. A review copy was provided by the publisher. The reviewer once served on the Ford Motor Company Consumer Advisory Board. General Motors lost $45 billion in the last 15 months of Rick Wagoner’s tenure as CEO. Bill Vlasic is also the co-author of Taken for a Ride: How Daimler-Benz Drove Off With Chrysler (2001).